Information tracked in a CRM system include contact information, prospect mapping, sales history, customer communications, customer technical support requests, and more. The more successful Enterprise CRM solutions also supports a company’s ability to measure and ‘score’ the priority of certain sales activities or prospects. 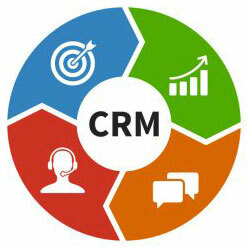 Below are some top CRM Software products for businesses. The Salesforce cloud is an on-demand customer relationship management (CRM) suite offering applications for small, midsize and enterprise organizations, with a focus on sales and support. The Salesforce app has capabilities that include sales management, marketing automation, partner relationship management and customer service. Microsoft Dynamic brings together CRM and ERP requirements onto one platform. It is a suite of easy-to-learn and easy-to-use business solutions tailored to your market, designed for your business size, and dedicated to growing your business through happy customers. HubSpot CRM is a free CRM service. It arms your sales team with the information and the tools needed for today's modern sales process. HubSpot CRM gives you the ability to create contacts, company, and deal records. BPM Online CRM is a cloud-based software that merges customer relationship management features with business process management capabilities. Cloud-based CRM systems deliver automated business processes to manage the complete customer journey – from lead nurturing to opportunity management, and continued account maintenance. Marketing 360 gives you the ability to manage all your leads & customers in one place. Add as many team members as you need, create custom fields to store any contact information, assign tasks, track deals, and sales pipelines and so much more. Zoho CRM is an online Customer Relationship Management (CRM) software program for managing your sales, marketing & support in a single system. SugarCRM enables businesses to create extraordinary customer relationships with the most innovative and affordable CRM solution on the market. SugarCRM takes pride in getting to know customers personally so they can identify and service their unique needs.